I was fortunate enough to snag this somewhat rare book for just $2.50 at a secondhand bookstore recently. It’s famous in ufology circles for giving the first in-depth description of the Men in Black, those not-quite-human, not-quite alien dudes who show up after close encounters to tell witnesses, “You saw the planet Venus.” The first book to mention them was was Gray Barker‘s They Knew Too Much About Flying Saucers (1956), and I doubt it’s any coincidence that Barker was also the publisher and editor of Flying Saucers and the Three Men. Albert K. Bender was a sci-fi and horror aficionado from Bridgeport, Connecticut, who founded one of the first UFO organizations, the International Flying Saucer Bureau (IFSB), in 1952. Just two years later, he shut it down with the cryptic explanation that the saucer mystery had been solved, and it would be dangerous to continue the IFSB’s work. For over a decade, Bender refused to give more than a handful of tantalizing clues to why the IFSB had folded. 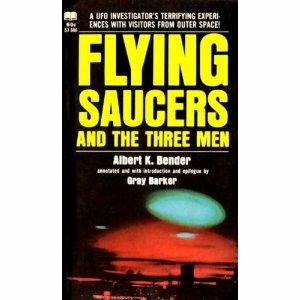 Then, in 1968, West Virginian ufologist and publisher Gray Barker released this book, a full account of what happened to Bender and the IFSB. Barker remains an enigmatic and controversial figure in the world of ufology, the subject of two documentaries (Whispers from Space and the recent Shades of Gray) and much speculation. He undoubtedly staged a few hoaxes in his time, and allegedly confessed that he created the Men in Black out of whole cloth. So it should come as no shock that Bender’s book props up some of Barker’s own work. For instance, the three Men in Black who visited Bender were actually aliens in disguise, and their true form resembled that of the “Flatwoods Monster”. Barker was the chief investigator and promoter of the Flatwoods incident. Bender gives us a very detailed overview of the IFSB’s formation and work, then delves into the reasons for its closure: Bender had an out-of-body experience, apparently caused by visitors from outer space, and in his astral body was taken to a spaceship stationed somewhere in the Antarctic. His escorts on this journey were three aliens with brightly glowing “lightbulb” eyes, disguised as floating men dressed all in black (black suits, black gloves, black homburg hats). On board the ship, another Flatwoods-type alien disguised as a human gave him a brief history of alien visitation to Earth, and explained that the aliens were mining our oceans for some unnamed substance essential to their survival. The refining process they used on the saltwater produced a strange, stringy byproduct that was sometimes left behind (though Bender doesn’t name this stuff, it was very common to early UFO reports and was usually referred to as “angel hair”. After the ’50s, it vanished from UFO stories). The aliens expressed great concern about our use of nuclear weapons and energy, but they didn’t seem too eager to help out in any way. They just wanted to mine our oceans, then return to their home planet without any trouble. For this reason, they warned Bender not to say anything about their presence. If he did, he might just become a hostage like a few other meddling humans. Once they were safely en route back home, the aliens told Bender, he could reveal everything they had told him. Silly as all this is, Bender’s book gives us invaluable insight into the early years of American ufology and the creation of the UFO mythos. Interestingly, it contains what may be the first mention of an alien implant; Bender experienced strange headaches both before and after his encounters with the “three men”, and suspected that they had placed some sort of object in his sinus cavity. Of course, many of today’s alien abductees believe this is exactly what the aliens have done to them (in Bender’s case, an X-ray showed no abnormalities). The book also touches on other pseudoscientific theories that are still with us today, including pole shifts (a favourite topic of the 2012 catastrophist crowd). For anyone interested in the roots of ufology and the making of modern legends, Flying Saucers and the Three Men is well worth a read. This entry was posted in Books, Reviews, UFOs and tagged MIB, ufology. Bookmark the permalink. Just another cliche book about flying saucers with nothing particular. There is a certain smugness to most articles that dismiss all UFO and related phenomena lumped together. But there are seams and cracks that won't go away if one is willing to read and investigate enough.I recently became aware of Dr. Roger Lier's work dealing with — yes, alien implants… or at least potentially alien. There are WAY too many incidents of strange phenomena in the world over very long periods of time to be dismissed with one fell swoop. I'd say keep an open mind and keep reading.